Uber's fleet of luxury black hire cars, a driver rating system and live vehicle tracking all combine to make travel a more comfortable experience. It's certainly worth checking out, though you will pay a premium. If you regularly catch taxis in Sydney, you'll know that they aren't always the best experience. Uber, a private car service that originated in San Francisco, is now available in Australia. With a fleet of luxury black hire cars, a driver rating system and live vehicle tracking, Uber is certainly worth checking out, though you will pay a premium for its service. The idea of Uber is both simple and effective. Simply download the app, create an account, pre-register a credit card and you're good to go. It's worth nothing that Uber doesn't actually employ its own drivers or own the fleet of cars used. The app simply connects passengers with private hire car drivers using the app. As an example, a driver can work full time for Uber if he chooses (by using the UberDriver app) or work with Uber whenever he chooses. The Uber app itself is free to download and very well designed. Once you've logged in and added your credit card details, the app immediately launches into a pickup location screen showing a map of your current location. Enter an address and you're given an estimated pickup time. The map also shows the location of current Uber cars in the surrounding area. We found the live tracking feature quite accurate and very handy, though we wish you could save frequently used dropoff and pickup locations such as "work" or "home". The app allows you to get a fare estimate by inputting a drop off location. Uber says that "on average" the service is 20 per cent more expensive than a taxi, but it can often be over this figure. Uber charges an $8 flag fee, a $3.25 fast kilometre (km) rate, a $1.25 slow km rate and a 3 per cent credit card charge. Uber also states that during times of "intense demand", such as New Years Eve, the rates are subject to change over time in order to keep vehicles available. 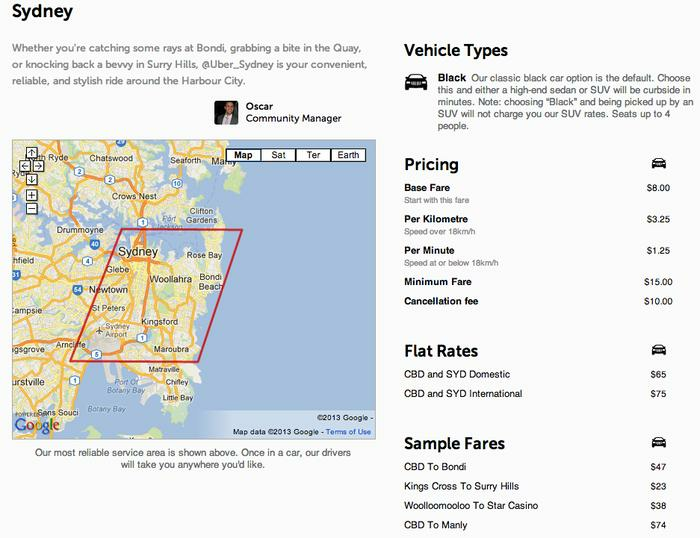 An overview of Uber's pricing structure in Sydney. Once you confirm your booking, the app displays your drivers name, driver rating, car model and number plate. You can also call the driver if you wish. The fleet of hire cars used are mainly Holden Statesman or Caprice models, but there are a number of luxury 4WDs also used in Sydney. Once your trip has ended, you simply exit the vehicle. The driver will end the trip and a receipt will immediately be emailed to you and displayed through the app detailing all the charges. Though the idea of credit card billing may not suit all users, it's convenient if you're in a hurry. Disclosure: Ross Catanzariti received $100 worth of Uber credit for journalist review purposes.